The Downtown Development Authority’s plan to spruce up Flagler Street has moved into high gear, with an important new component. Property owners on the street are now willing to tax themselves to pay for part of the improvements, said Neisen Kasdin, authority vice chairman and office managing shareholder of the Akerman Senterfitt law firm. Property owners on Ocean Drive in Miami Beach agreed to a similar self-assessment when that street was being upgraded, Mr. Kasdin added. The amount of the assessment hasn’t been decided yet, in part because the authority plans to investigate all possible funding sources for the project’s cost of $5 million to $10 million. 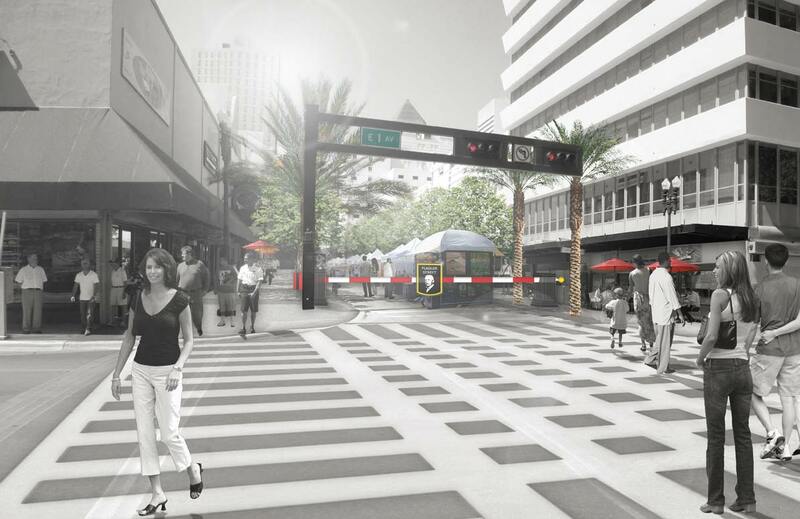 Miami-Dade County has funds set aside for economic development projects; the authority will ask it to earmark some of that money for Flagler Street. “The owners’ involvement is very compelling, and it will be difficult for the county to say no,” Mr. Kasdin said. The new design will feature a railroad theme, highlighting Standard Oil tycoon Henry M. Flagler’s achievement in pushing the Florida East Coast Railroad past Palm Beach and into Miami, thus connecting the fledgling city with the rest of the world. Property owners and landlords on Flagler viewed renderings at a well-attended meeting Oct. 21, and the feedback was good, authority sources said. The sidewalk design alternates light and dark grey bands of concrete to give the effect of railroad tracks, and an actual railroad tie will be imbedded in the sidewalk to separate the walking surface from the street furniture and trees. The concrete was chosen because it is inexpensive, durable and easy to replace. “One request we had from the business owners was the ability to close off the street for special events,” Mr. Betancourt said. At first, bollards were considered, but the designers instead incorporated movable gates like those at railroad crossings. They can be propped up vertically when not in use. “That’s the most thematic element,” he added. Shade trees, bike racks and other furnishings complete the picture. “The basic concept was to widen the sidewalks for outside cafes and make them more walkable; this design accomplishes that,” Mr. Betancourt said. The plan is expected to go to the authority’s board for approval next month. Flagler Street has long been a concern to downtown business owners. Many sidewalks have been expanded, restricted or rebuilt over the years. In addition, street surfaces are uneven, and a failed pavers project has left many conflicting surfaces. Because underground pipes, drains and utility lines were antiquated and in severe disrepair, the City of Miami had to replace those before the above-ground work could be tackled, authority sources said. So glad to see this project is moving forward. My friends at Curtis + Rogers have been working on this for a very long time. I saw the renderings and boards that were headed to this meeting and they looked great. The thought, consideration and design that went into this project could have only come from a local firm that lives, works and plays in our community. I applause DDA for hiring a local firm. This practice should be done across all municipalities in Miami-Dade County. Aida, Esperanza are there any links to the renderings? Nice job. Simple and utilitarian. The only thing missing is a bronze statue to Flagler, something this burg could use more of– like in NYC or any great European city where you can’t help but round a corner and bump into representational public sculpture. And, if anything like that should ever happen, hire a local sculptor for the job– like the DDA did here with the new streetscape.